What is collaborative problem solving? See also "Girls outperform boys in collaborative problem solving"
In total 52 countries and economies participated in the 2015 assessment of collaborative problem solving. OECD countries: Australia, Austria, Belgium, Canada, Chile, the Czech Republic, Denmark, Estonia, Finland, France, Germany, Greece, Hungary, Iceland, Israel, Italy, Japan, Korea, Latvia, Luxembourg, Mexico, the Netherlands, New Zealand, Norway, Portugal, the Slovak Republic, Slovenia, Spain, Sweden, Turkey, the United Kingdom and the United States. Partner countries and economies: Beijing-Shanghai-Jiangsu-Guangdong (China), Brazil, Bulgaria, Colombia, Costa Rica, Croatia, Cyprus*, Hong Kong (China), Lithuania, Macao (China), Malaysia**, Montenegro, Peru, the Russian Federation, Singapore, Chinese Taipei, Thailand, Tunisia, the United Arab Emirates and Uruguay. *Note by Turkey: The information in this document with reference to « Cyprus » relates to the southern part of the Island. There is no single authority representing both Turkish and Greek Cypriot people on the Island. Turkey recognises the Turkish Republic of Northern Cyprus (TRNC). Until a lasting and equitable solution is found within the context of the United Nations, Turkey shall preserve its position concerning the “Cyprus issue”. Note by all the European Union Member States of the OECD and the European Union: The Republic of Cyprus is recognised by all members of the United Nations with the exception of Turkey. The information in this document relates to the area under the effective control of the Government of the Republic of Cyprus. ** Coverage is too small to ensure comparability. Results are included in tables and a selection of figures. How does PISA measure students’ ability to collaborate? 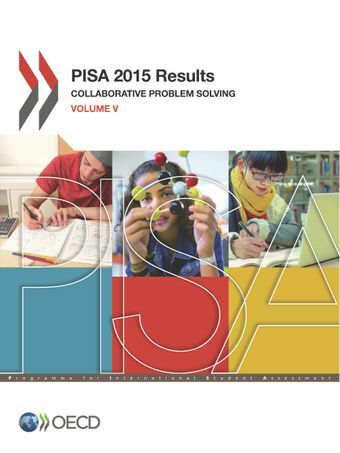 A short description of how PISA assesses collaborative problem solving.